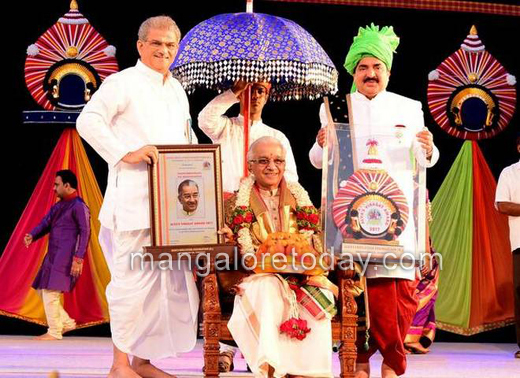 Moodbidri, Jan 14,2016: Speaking on being conferred Alva’s Virasat Award 2017, instituted by Alva’s Education Foundation, in Moodbidri on Jan 13, Friday, Bharatanaty-am exponent V P Dhananjayan said art bring all hearts together. "Dance as such, is only physical action. Indian dance is not just a dance, but ’Natya’. It is physical, mental as well as spiritual. This is the uniqueness of our traditional dance in India. Natya is also a system of education. Character is imbibed through art integrated education. Art refines one’s mind. Bharatanatyam shows a great heretage. Our country is ’Bharatha’. Bharatha is the land which eradicates the ignorance of the whole world." The Virasat honour is very unique and will be cherished by him, he added. Felicitation : A felicitation was offered to Dhananjayan with a performance of Mohiniyattam, Bharatanatyam, Manipuri, Kuchipudi, Sattriya, Kathak, Odissi, Kathakkali and Yakshagana. Earlier speaking inaugurating Alva’s Virasat, Dharmasthala Dharmadhikari Dr D Veerendra Heggade said greatness of the heart is what makes a human being a great one. "There is a deep and great responsibility on us all to give a good future to the next generation. Good education is one which gives good character, creates a good person," he added. Prior to the inauguration, a colourful procession was taken out. Shankhanada, Chende, Dollu, Honnavara band, artistes from Sri Lanka and others took part in the procession. Dhananjayan’s spouse Shantha, Alva’s Education Foundation Chairman Dr M Mohan Alva, MP Nalin Kumar Kateel, SCDCC Bank President M N Rajendra Kumar, Karnataka Bank MD and CEO P Jayaram Bhat and others were present amidst a sea of students, youth and public. Of all the district Dakshina Kannada is said to have one of the unique form of culture and tradition is liked and enjoyed by all. We have to appreciate Mohan Alva for giving the best to the people . it also requires the co-operation from he entire team too. The people of Mangaluru wait for Alva’s Cultural event every year. Alva’s Virasat gives importance to cultural programme . In present generation take our younger generation towards such.